Poison Pond is the twenty-sixth level of Donkey Kong Country, and twenty-fifth level in the Game Boy Advance remake of the same game. It is also the fourth level of the Kremkroc Industries, Inc. area in the Super Nintendo and Game Boy Color versions of the game, and the third level in the Game Boy Advance remake (having switched positions with Elevator Antics). This is the fourth and final underwater level in the game. 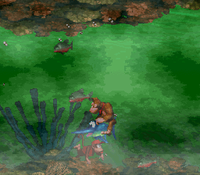 In the level, Donkey Kong and Diddy Kong have to swim through a large polluted pond. As they travel, they have to fight through several Bitesizes, Chomps Jrs., Chomps, and Squidges. The main hazard here, however, is the numerous Mincers, scattered all over the stage, moving all around. One touch of these spiky hazards can damage a Kong, who can only be recovered with a DK Barrel. Luckily, Enguarde the Swordfish appears in this level - although his attacks are found useless against the rock-hard and invincible Mincers, but his speed is crucial in terms of the Kongs avoiding damage from them. 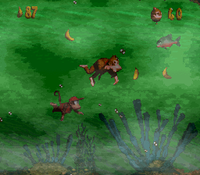 Although the water in this level appears to be green and toxic, the Kongs are not hurt by it at all, nor does it affect gameplay. 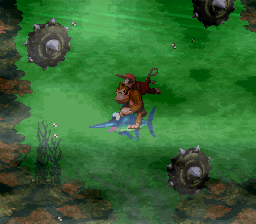 Like all other underwater levels in Donkey Kong Country, Bonus Levels are not present in Poison Pond. The Kongs progress through the early part of the level. The level begins in a wide area full of Bitesizes with an alcove above it that contains the letter K. As the area starts to become narrower, the heroes approach the level's first DK Barrel, which is followed by a trail of bananas leading through a passage to the north. An optional path to the right of the barrel leads to a Chomps Jr., a Banana Bunch, and then a dead end. If the primates follow the banana trail, they can find a wider area to their right and a thinner area to the left, where two Chomps Jrs. and another Banana Bunch can be found. If they travel to the right, they come past a Mincer and a few underwater enemies, such as a Squidge. After passing a pair of Mincers that both move in a vertical path across the whole area, the Kongs can find a small alcove containing a Banana Bunch that is guarded by a fourth Mincer. A passage to the north of here leads to an open area with two Mincers grinding across it. A thin channel is to the left of the top of this area that leads the primates into a wider passage containing more Squidges and a DK Barrel. Two Mincers parallel to each other are ahead, and another Mincer moves in a horizontal path above them. Once the Kongs pass these foes, they come up to a few Bitesizes and a group of bananas that are followed by two more Mincers moving in horizontal paths. The Kongs can maneuver around the obstacles to find many Squidges and reach a passage facing north, where the letter O is located. At the top of the passage, they can find a narrow channel with a Mincer in it to the east. The level's Star Barrel is immediately after the hazard. From the Star Barrel, the heroes can discover an arrow that is formed by a multitude of bananas. A few alcoves that Mincers move in and out of are placed along the sides of the passage ahead of here. After the primates pass them, they approach a large area with a pathway to the north and a pathway to the east, where an Animal Crate containing Enguarde is located. A small pathway below the crate leads to a few Mincers. If the duo travels through the passage to the north, they encounter another Mincer in a tight space. They can use an alcove in the area to avoid the Mincer as it grinds across the passage. A large, open area is ahead with a DK Barrel in the bottom corner of it and a channel running through the north of it. Another large area containing three Mincers that move in a circular patten together area on the other side of the channel. Another channel to the left of here leads into a thin area with a Mincer moving through it. The group sits in the final part of the level. The Kongs must take refuge in the alcoves around the passage to avoid it. Three more Mincers circle a wider area nearby, which has a passage at the bottom of it that leads to another open area with two stationary Mincers at the bottom of it. Another Mincer moves in a horizontal path above them. Two more open areas are ahead of here, each containing a single Mincer that is orbited by another. A DK Barrel is also in the first of the areas. Once these parts of the levels are passed, the primates can find a long passage facing north with two Mincers traveling throughout them. An alcove in the center of this passage can be used to help the two friends dodge the obstacles and safely reach a channel that leads into a long and wide area containing numerous Bitesizes, a sign indicating that the level is almost over, and the letter G. After swimming between two Zingers farther into the level, the Kongs can journey to the level's exit, located immediately after an exit sign. K: If the Kongs head north immediately after they begin the level, they enter a large alcove with the letter K in it. O: As the Kongs head up a passage to the north just before the Star Barrel, they come up to the letter O.
N: Shortly after the Kongs pass the area where Enguarde can be found, they can find a group of Mincers moving in a circle. The letter N is in an alcove to the left of this area near another Mincer that moves in a horizontal path. G: The letter G is placed just before the level's exit behind the last two Mincers in the stage, found near a wide area full of Bitesizes. The group encounters the photograph. Shortly after the level's Star Barrel, the Kongs can find two Mincers moving in and out of alcoves. They should maneuver around the second one to make their way into one of the alcoves, where a camera icon is located. When they grab it, they earn a photograph of a Squidge in the third page of their scrapbook. Diddy finds Enguarde's crate in a hidden area right behind the starting point. The group travels under a Mincer. Enguarde and Donkey swim next to the Star Barrel. This page was last edited on April 9, 2019, at 18:28.